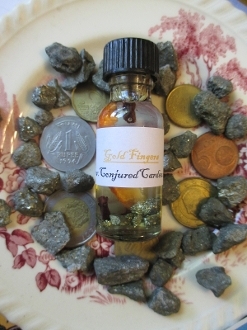 Gold Fingers oil is an amazing formulas created with pyrite, fennel seed, a small dice as well as jasmine, neroli and other essential oils. It is designed to bring you the fastest luck and results in all areas of life, especially those areas concerning opportunity and money. Wonderful for games, gambling, interviews and for repeat clientsd. Let whatever you touch be turned into golden blessings! Use this oil on orange, yellow or green candles.